All sides of the Black, Blue, and All Lives Matter movements. 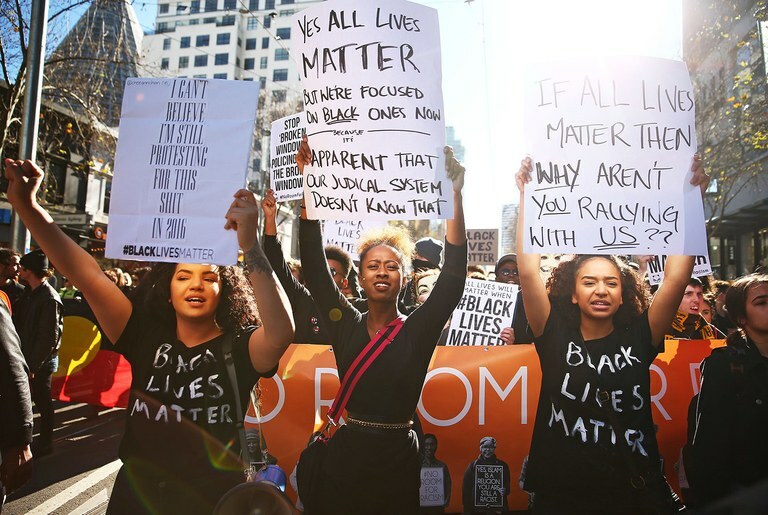 African Americans have faced a long and harsh history of discrimination in this country, and just because the Black Lives Matter (BLM) movement started in 2013 does not mean that it is no longer relevant today. Just recently, on Jan. 11, there has been a cry from those attached to the movement to arrest prominent Democratic supporter Ed Buck, for a second black man has been found dead at his home. BLM is the movement that spurred both the Blue Lives Matter and All Lives Matter movements. Recently, the Blue Lives Matter movement has risen up to face the death of Officer Natalie Corona, who was shot by a random bystander while she was conducting an investigation on a traffic collision. This death is likely unrelated to the BLM movement, but it does show that officer’s lives are always at risk. All Lives Matter works alongside the Blue Lives Matter movement, and both have become associated with criticizing the Black Lives Matter movement, which has made it harder for them to gain traction. Most people in the Black Lives Matter movement would agree that all lives do matter, but that is not the point that they are trying to make. Their movement does not mean to say that police lives don’t matter, and they do not associate with anyone who has shot police in the name of the movement. These movements truly began after the death of Eric Garner and shooting of Michael Brown, which led to what is assumed to be revenge via murder of officers Ramos and Liu. Eric Garner was choked to death by police after resisting an unwarranted arrest. There is a video of the event*, and it is clear that the police don’t perform CPR while waiting for the ambulance, and do not bother to check if he is still breathing. Although that is now realized to be unlikely, “Hands up, don’t shoot” became a rallying cry for both peaceful and violent protesters that night. A few months later, a man named Ismaaiyl Abdullah Brinsley killed the two police officers. He shot them both in the upper body and head with a handgun through their patrol windows while he was walking by. He then ran into the subway, where he committed suicide. Earlier that day, he had murdered his ex-girlfriend. He also posted on Instagram that he would be killing two officers that day hours before killing them. The targeting and death of those innocent officers is largely what spurred the rise of the Blue Lives Matter movement. In 2018, 148 officers died in the line of duty, and 63 of those deaths were intentional assaults. However, 995 citizens were shot by police in 2018, and 21% of those deaths were African American people, which people who support BLM argue is significantly larger than the estimated percent of African Americans in the population, which is 13%. Although, in many of those cases, police officers had a complete right to defend themselves, the BLM movement makes an argument that police officers have chosen, and make the choice every day, to continue being a cop, which comes with risking your life. Many of the 995 people who were shot by police over the course of 2018 may not make that same choice. *I am not going to link the video because it is very sad and also what I consider to be graphic, but if you truly want to you can look up Eric Garner’s death on YouTube.